Much of the information I used for this form came from a single source: Poetry Magnum Opus. If you'd like a better look at these, or any other forms, please check this site out. Judi Van Gorder has the most comprehensive poetry site available and even includes indexes to make searching for a form all that much easier. Lu Shi, or code verse, is a genre of Chinese forms that carries two or more parallels of content and phonetic tone. Shi (meaning verse or lines of equal length) seems to dominate traditional Chinese poetic form whether the poem is written in an established form that restricts syllables or not. Most traditional Chinese poetry is made up of 4 lines with parallel content and phonetics. The lines are composed, Qi - beginning, Cheng - development, Zhuan - returning, and Jie – finishing. The phonetic tones or pitch of Chinese poetry are long tones, maintenance of a single pitch, or deflected tones which are relatively short with the pitch moving up or down. The deflected tone is said to be either, rising, falling or entering. The tonal feature of Chinese poetry is impossible to achieve in English. The basic rhythmic unit of a Chinese poem is the single character (zi), which is pronounced as one syllable. The language consists primarily of zi, mono syllabic words, limiting the English imitator to only a portion of the English vocabulary. Most English descriptions of Chinese poetic patterns use the words "syllable count", but the word "character count" would be more accurate. The original poems in form were written in Chinese characters which include more components than just syllable count. The word character loosens the spectrum of syllable count to possible word count, making English use of the forms more compatible. The code verse values match and balance and tend to be responsive not imaginative. There are hundreds of code verses but I’m only going to concentrate on the four forms common to the Tang dynasty 618-907 AD. The Ch'I Yen Shih is the oldest of the Lu Shi. It is usually written in only one quatrain, and never more than three quatrains in length. It has 7 characters per line which in Chinese are mono-syllable words but could be words of more than one syllable in English. Usually there is a caesura after the 4th word in a line. It is always written with parallels and balance and it has a rhyme: x-a-x-a (where x has no rhyme). The Wu Yen Shih is an expansion of the Ssu Yen Shi. Again it is usually written with only one quatrain, never more than three quatrains. The lines are five characters long, composed of mono-syllable words with a caesura after the second word. The rhyme scheme is a-b-a-b. The Chueh Chu (chu meaning song) or Regulated Verse is the Chinese "sonnet short cut". It is a verse form that uses both the Chi Yen Shih and Wu Yen Shi meters. It is an eight line meditation made up of two quatrains of either the Chi Yen Shih or Wu Yen Shih meters, or a combination. Variable rhyme schemes may be used, Rhyme schemes may be: a-a-x-a and x-a-x-a or x-b-x-b and x-b-x-b or a-a-x-a and a-a-x-a (x being unrhymed). Built word by word, to be strong. Of the four forms, I think I enjoyed the Chueh Chu the most, mainly for the variety of choice when it came to the rhyme scheme. As you can probably guess, my least favorite was the Ssu Yen Shih. The syllable counts and rhyme schemes weren’t as bad as having to use one syllable words. I invite everyone to give them a try, and let me know what your favourite is. The Porcelain Tower of Nanjing no longer exists, but it was located on the south bank of the Yangtze River in Nanjing Territory in China. 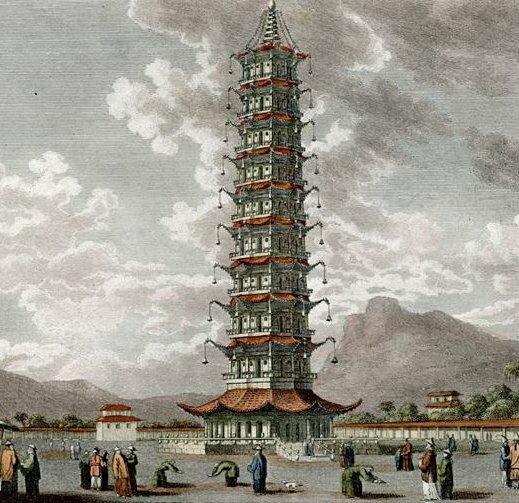 Also known as Bao'ensi (meaning "Temple of Gratitude”) or the Porcelain Pagoda, the tower is one of the most notable archaeological and historical sites in China. It was constructed by a Chinese Emperor by name Yung le in the 15th century during the Ming Dynasty as a Buddhist place of worship. The tower was octagonal with a base of about 97 feet (30 m) in diameter. When it was built, the tower was one of the tallest buildings in China, rising up to a height of 260 feet (79 m) with nine stories and a staircase in the middle of the pagoda, which spiralled upwards for 184 steps. The top of the roof was marked by a golden pineapple. What set the Porcelain Tower apart was its exquisite beauty. The tower was covered with superior quality white and shining porcelain bricks interlaid with coloured stones. The entire area reflected the sun's rays during the day, and at night as many as 140 lamps were hung from the building to illuminate the tower. Glazes and stoneware were worked into the porcelain and created a mixture of green, yellow, brown and white designs on the sides of the tower, including animals, flowers and landscapes. The tower was also decorated with numerous Buddhist images. In 1801, the tower was struck by lightning and the top three stories were knocked off. This was repaired, but the Taiping Revolution marked its end. The rebels who took control of the area (1840-1850) smashed the Buddhist images and destroyed the inner staircase to deny the Qing enemy an observation platform. Some American sailors visited the area and reported to have seen a hollow structure. In 1856, the Taiping destroyed the tower in order to prevent a hostile faction from using it to observe and shell the city. After this point, the tower's remnants were forgotten and it lay dormant until a recent surge to try to rebuild the landmark. For a long time the rubble and ruins remained at the site where it once stood on the bank of the river Yangtze, but the Chinese Government finally decided to reconstruct this medieval wonder of the world and that rubble has been cleared. In November of 2010, philanthropist Wang Jianlin donated 1 billion yuan ($15.3 million in U.S. dollars) to the reconstruction of Nanjing's Porcelain Tower. Wang said his donation is out of respect toward traditional Chinese culture, even though he is not a Buddhist. Until the reconstruction is finished, you can still see some of the original blocks of the Nanjing Tower's arched door, now pieced back together and on display at the Nanjing Museum. The “going to bed earlier so I can get up earlier” thing met with moderate success. What can I say? The spirit was willing but the body was wired to stay up late. Of course it didn’t help that I’d shut the lap top down early so I could get a little reading time in, and then not come up for air for hours. As for the “staying off the internet” part . . . well, again I can only say that it met with moderate success. I still checked my e-mail in the morning, and I may have checked the feeds for Facebook, but for the most part I stayed off the net during “working” hours unless I had to do research. I’ve also discovered that I have to check to make sure my posts are going up on time. A couple of times blogger saved my post as a draft instead of a scheduled post, so instead of going up at 8 a.m. sharp it ended up going up whenever I thought to check (usually around noon). I have no clue why this is happening. I read a couple of really interesting books last week – books I probably would have passed up on in the store, but I downloaded for free from Amazon. This is one of the really great things about George (my Kindle), it’s broadening my reading scope. Even when you have to pay for a book, your dollar still stretches further than with print books so you’re more willing to take a chance on something new or different. Tuesday: Part V of the Seven Wonders of the Medieval World is the Porcelain Tower of Nanjing. Wednesday: A new hunk for your viewing pleasure. Thursday: This week will feature four forms of Lu Shi (code verse). Friday: Chapter 30 of Fire. How’s Pyre going to find Rayne again, or did the raiders take him as well? Today: I’m whining about remakes. Wednesday: Chapter 7 of my on-line serial Shades of Errol Flynn. Will we finally get to see what’s in the mysterious box? First up is catching up on my blog reading/commenting. I love seeing what other people have to say, so I’ve got a lot of blogs on my list. The problem is finding the time to do it. I think I’m going to try dedicating an hour or so each day to this. Walk every day. Some other form of exercise if the weather isn’t conducive to walking. Learn how to use my iPod so I can take it with me on my walks. Make up a workable schedule for all the stuff I want to accomplish during the day. Life’s too short for all this frittering around. Work on the sound boosting and transcribing for the Living History project. I think that’s plenty for one week, don’t you? How about you? What are you up to? The Blitz Poem was created by Robert Keim. This fast paced poem is made up of 50 lines of short phrases and images with repetition. You begin with one short phrase or image of at least two words. Begin the next line with another phrase that begins with the same first word as line 1. Lines 3 and 4 should begin with the last word of line 2. Lines 5 and 6 begin with the last word of the 4th line, and so on until you’ve made it through 48 lines. There should be no punctuation. A Blitz is read very quickly, pausing only to breathe. The Great Wall of China is not a continuous wall but is a series of short walls that often follow the crest of hills on the southern edge of the Mongolian plain. Known as "long Wall of 10,000 Li" in China, it extends about 8,850 kilometers (5,500 miles). 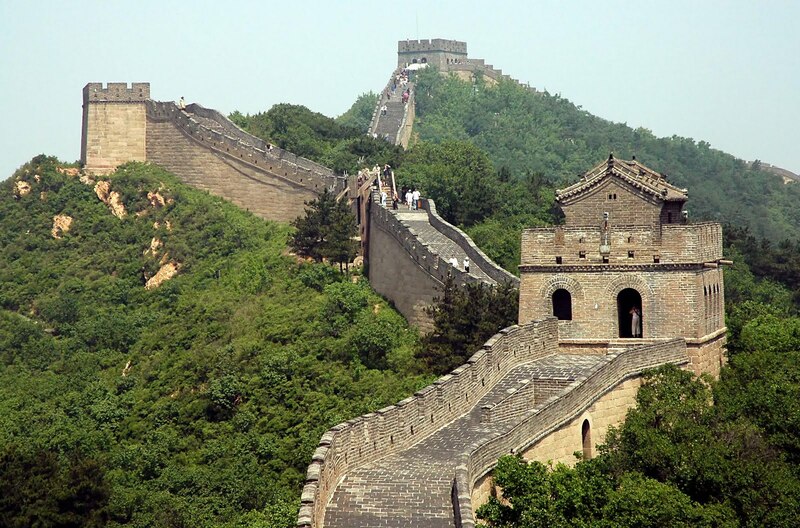 Before the use of bricks, the Great Wall was built from rammed earth, stones, and wood. During the Ming Dynasty, however, bricks were heavily used in many areas of the wall, as were materials such as tiles, lime, and stone. The size and weight of the bricks made them easier to work with than earth and stone, so construction quickened. As well, bricks could bear more weight and endure better than rammed earth. Stone can hold under its own weight better than brick, but is more difficult to use. Consequently, stones cut in rectangular shapes were used for the foundation, inner and outer brims, and gateways of the wall. Battlements line the uppermost portion of the vast majority of the wall, with defensive gaps a little over 30 cm (12 in) tall, and about 23 cm (9.1 in) wide. During the Warring States Period, from the 5th century BC to 221 BC, the states of Qin, Wei, Zhao, Qi, Yan and Zhongshan all constructed extensive fortifications to defend their own borders. Built to withstand the attack of small arms such as swords and spears, these walls were made mostly by stamping earth and gravel between board frames. Qin Shi Huang conquered all opposing states and unified China in 221 BC, establishing the Qin Dynasty. Intending to impose centralized rule and prevent the resurgence of feudal lords, he ordered the destruction of the wall sections that divided his empire along the former state borders. To protect the empire against intrusions by the Xiongnu people from the north, he ordered the building of a new wall to connect the remaining fortifications along the empire's new northern frontier. Transporting the large quantity of materials required for construction was difficult, so builders always tried to use local resources. Stones from the mountains were used over mountain ranges, while rammed earth was used for construction in the plains. Later, the Han, Sui, Northern and Jin dynasties all repaired, rebuilt, or expanded sections of the Great Wall at great cost to defend themselves against northern invaders. It is estimated that over 1 million workers died building the wall. The Great Wall concept was revived again during the Ming Dynasty, following the Ming army's defeat by the Oirats in the Battle of Tumu in 1449. The Ming had failed to gain a clear upper hand over the Manchurian and Mongolian tribes after successive battles, and the long-drawn conflict was taking a toll on the empire. The Ming adopted a new strategy to keep the nomadic tribes out by constructing walls along the northern border of China. Acknowledging the Mongol control established in the Ordos Desert, the wall followed the desert's southern edge instead of incorporating the bend of the Huang He. Towards the end of the Ming Dynasty, the Great Wall helped defend the empire against the Manchu invasions that began around 1600. Under the military command of Yuan Chonghuan, the Ming army held off the Manchus at the heavily fortified Shanhaiguan pass, preventing the Manchus from entering the Chinese heartland. The Manchus were finally able to cross the Great Wall in 1644, when the gates at Shanhaiguan were opened by Wu Sangui, a Ming border general who disliked the activities of rulers of the Shun Dynasty. The Manchus quickly seized Beijing, and defeated the newly founded Shun Dynasty and remaining Ming resistance, to establish the Qing Dynasty. Under Qing rule, China's borders extended beyond the walls and Mongolia was annexed into the empire, so construction and repairs on the Great Wall were discontinued. Restoration and rebuilding took place in the 20th century and in 1987 the Great Wall of China was made a World Heritage Site. While some portions north of Beijing and near tourist centers have been preserved and even extensively renovated, in many locations the Wall is in disrepair. Parts have been destroyed because the Wall is in the way of construction. Sections of the Wall are also prone to graffiti and vandalism. More than 60 km (37 mi) of the wall in Gansu province may disappear in the next 20 years, due to erosion from sandstorms. In places, the height of the wall has been reduced from more than five meters (16.4 ft) to less than two meters. The square lookout towers that characterize the most famous images of the wall have disappeared completely. Many western sections of the wall were constructed from mud, rather than brick and stone, and thus are more susceptible to erosion. Most people are familiar with the claim that the Great Wall of China is the only man-made object visible from space with the naked eye. One of the earliest known references to this myth appears in a letter written in 1754 by William Stukeley (who pioneered the investigation of Stonehenge). He wrote that, "This mighty wall of four score miles in length (Hadrian's Wall) is only exceeded by the Chinese Wall, which makes a considerable figure upon the terrestrial globe, and may be discerned at the moon." The claim was also mentioned by Henry Norman in 1895 where he states "besides its age it enjoys the reputation of being the only work of human hands on the globe visible from the moon." The issue of "canals" on Mars was prominent in the late 19th century and may have led to the belief that long, thin objects were visible from space. The claim that the Great Wall is visible also appears in a 1932 Ripley's Believe it or Not cartoon and in Richard Halliburton's 1938 book Second Book of Marvels. The truth is, from a low orbit of the earth, many artificial objects are visible on the earth, such as highways, ships in the sea, railroads, cities, fields of crops, and even some individual buildings. Therefore, while at a low orbit, the Great Wall of China can certainly be seen from space. However, when leaving the earth's orbit and acquiring an altitude of more than a few thousand miles, no man-made objects are visible at all. NASA says, "The Great Wall can barely be seen from the Shuttle, so it would not be possible to see it from the Moon with the naked eye." Furthermore, from the moon, even the continents are barely visible. Whether it can be seen from space or not, the Great Wall of China is still a most awe inspiring Wonder of the Medieval World. I’m slowly starting to realize that I’m more productive in the mornings than I am later in the day. So this calls for a few changes in the way I’ve been doing things. First of all, I’m going to try to start getting to bed earlier so I can get up earlier. Stop laughing . . . seriously, stop laughing . . . right now! Okay. We’ll take a brief pause here so you can get it out of your system. Laugh away. Better now? As I was saying, I’m going to try to make an adjustment in my sleeping schedule and then – and this is the real hard part, harder even than getting up early – I’m going to stay off the internet until after lunch. No e-mail checking, no blog surfing, no facebooking, nada. What I’ll be doing instead is writing. I’ve been finding lately that my concentration isn’t what it used to be. I’ll sit in my recliner in the evening fully intending to write while I’m watching television, only I don’t. I surf around, or obsessively check between twitter and facebook and my e-mail, or *bows head in shame* play a mindless, on-line game. Then before I know it it’s 2 a.m. and I haven’t got the next day’s post written yet. So, the only answer is, write earlier in the day. Tuesday: Part IV of the Seven Wonders of the Medieval World is the Great Wall of China (on of my favourites!). Thursday: This week will feature The Blitz Poem. Friday: Chapter 29 of Fire. So who’s got Pyre and Rayne surrounded . . . and why? Wednesday: Chapter 6 of my on-line serial Shades of Errol Flynn. Today there is a Scribes meeting which I may or may not be prepared for. Last time I went empty handed, but when I got home I sat down and wrote my 150 word piece and then e-mailed it to the members who showed up. Tuesday I have a poetry group meeting for which I have not yet done my “poemwork”. We are supposed to write a Found Poem, which I did on my own for the last meeting, so I don’t know if I’ll get another one done or not. The one I did was a bit of a fluke. I do have a couple of other poems to read for the group, so I won’t be going empty-handed. I need to change the batteries in my camera so I can get those new pictures done so I can get back to working on my website. My sadly neglected little website. The kid has loaned me Season III of True Blood so you can bet your bippy that I’ll be doing some serious DVD watching this week. Hey, I can edit and watch at the same time! Less mindless gaming, more writing. I confess, I’ve been playing way too much Mahjong Connect 2 instead of writing. Time to get tough with myself again. Developed by Joseph S. Spence Sr.*, the Epulaeryu is a poetic form all about delicious foods. This poetic form is the direct result of experiencing Mediterranean and Far East cultures and enjoying the many succulent, nourishing meals & food during those various travels. The name can be broken down into two parts, Epulae, which is derived from the Latin work meaning a feast or a form of feast, and Ryu, which was selected from the Asian arts meaning form, style, or a certain way of doing something. The Epulaeryu form is being enjoyed by many across the world. The comments and responses being received from many are appreciated. It says to me that there are connoisseurs who are enjoying delicious and succulent dishes and drinks. We eat from dishes of varying sizes, and drink from glasses and cups of different shapes. As such, the Epulaeryu form has a different shape and the lines vary in size and syllable count. As one may note, there is an order to all formation of things in life. The military is an organization with a lot of formations. There is a type of formation for marching, training, fighting, playing sports and the like. There is also a numbering sequence for forms of activities and completion of tasks, like completing a progressive form in martial arts training. Having served in the military had some influence on the form of the Epulaeryu. Working things by the numbers was applied to establish the 7/5/7/5/5/3/1/ form. It’s so much easier to work with things by numbers for me; as one may guess, I had to help my children with their math homework. Additionally, applying the principles of deductive and inductive logic was a part of the process. Logically, the Epulaeryu flows in a deductive format from the top down. It starts with seven syllables, like a topic sentence, and ends with one. The last syllable is an emotional outpouring about the meal. In the alternative, one may also look at the Epulaeryu in an inductive manner, reading it from the bottom up like an inverted pyramid. It starts with the emotional exclamation point and works upward. Applying inductive logic, one is able to unravel the taste and delicacy of the culinary arts, meals, and drinks. * Joseph S. Spence, Sr. holds the title of Poet Laureate from Poets.com. He has received four Editor’s Choice Awards from Poetry.com for outstanding achievement during 2005 for the poems: The Beautiful Leaf, A Child’s Dream, Praising Him All The Way, and I Like Tropical Living. The name Kom el Shoqafa, is the Arab translation of the ancient Greek name, Lofus Kiramaikos which means “mound of shards” or “potsherds”. Located in Rhakolis, a fishing village in the old part of Alexandria City in Egypt, the underground tunnels date back to the 1st century AD and were used until the 4th century AD. There’s a story that they were discovered in 1900 when a donkey fell into a hole, but the more reliable story has it that they were discovered by Sayed Aly Gibarah who was quarrying for stone when he broke open the vault of the subterranean tomb. Located to the southwest of the Pompey’s pillar, the catacombs are a multi level labyrinth featuring dozens of chambers adorned with sculpted pillars, statues and other Romano Egyptian religious symbols, burial niches and sarcophagi as well as a banquet room of Roman style, where memorial meals were conducted by relatives of the deceased. a depth equal to the height of a five storied building a shaft six meters in diameter provided to let light and fresh-air in. This shaft had holes with the stairways to light up the stairs. It is believed that the catacombs were only intended for a single family, and it is unclear why the site was expanded in order to house numerous other individuals. One of the more gruesome features of the catacombs is the so called Hall of Caracalla. According to tradition, this is a mass burial chamber for the humans and animals massacred by order of the Emperor Caracalla. The entrance leads to a circular stairway with ninety-nine steps that lead to a vestibule with two benches carved in wall niches overarched by a cockleshell motif. A rotunda with a six-pillared shaft opens off the vestibule. On the left is the triclinium- a funeral banquet hall where friends and family gathered on stone couches with cushions- where they feasted in honour of the deceased. The vestibule leads to a circular hall called the "rotunda". 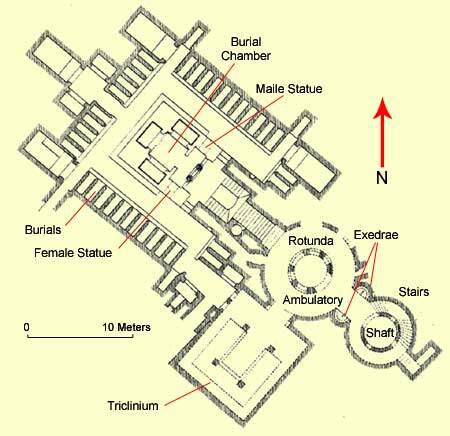 In the centre of this hall a shaft was cut leading to the second storey of the tomb and surrounded by a small enclosure wall called the "parapet" on top of which is a dome, supported by six pillars. Between the pillars there were figures of human heads, some of which were transferred to the Greco-Roman Museum in Alexandria. To the left of the rotunda is a vestibule. Its ceiling is supported by four pillars and it contains three benches, again cut in the rock, and takes the shape of the letter U. This chamber was called the “Triclinium”. Most probably, the room was used as a dining hall for visitors. Before accessing the main chamber there are two corridors, one in the east and the other in the west, each one leading to a large number of Luculi. After you descend to the hall that passes the Rotunda there is a small hall in front. In this vestibule, we see to the east a statue of a man inside a niche; while to the west there is a statue of a woman inside a similar niche. Both statues were sculpted in the Egyptian way, with some features of Greek art. Two composite columns, containing a mixture of Egyptian and Greco-Roman elements, support the façade of this hall. Among the Egyptian elements is the winged sun disk, the Falcon God Horus and the Uraeaus, or the cobra, while the Greco-Roman elements are represented in the pediment, at top of the chamber. There are hundreds of chambers and numerous sarcophagus tombs (‘sarcophagi’ literally means body eater as the type of rocks they’re made from absorb body matter). Many of the features of the catacombs merge Roman, Greek and Egyptian cultural points. Some statues are Egyptian in style, but with Roman clothes and hair style. Because the Catacombs of Kom el Shoqafa were covered over for so many centuries, they have been left in much the same state as when they were built. Visitors can still walk down the spiral staircase that leads onto the tombs, and see the well down the middle of these stairs where bodies were carefully lowered to their burial site. Even the designs on the walls when you reach the chamber below are still intact. 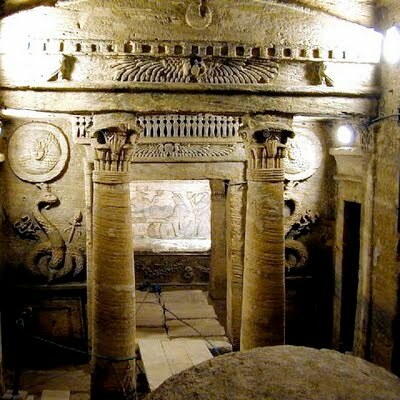 Considering they are centuries old, the Catacombs of Kom el Shoqafa are in incredibly good condition, and are an amazing testament to the architectural style of the time. Last week was a pretty good week, despite the fact that my serial instalment was a little late. I even managed to write an original example for Thursday’s poetry form. Got lots of writing and editing done, and even managed to get some reading in. I finished the edits on the really great book that belongs to someone else. No matter how many times I went over it, I never got tired of reading it. I can’t wait until it’s released and you can be sure I’ll be sharing the links on its release date so you can buy a copy. Trust me, you won’t be sorry! The weather was a little stormy last week – lots of rain, thunder, and lightning, and we even lost power a couple of times. This week is supposed to be good though. Thursday: This week will feature the verse form Epulaeryu. Friday: Chapter 28 of Fire. Hmm. I wonder what Rayne and Pyre are going to find in the temple of Nishon? Today: I’m discussing God and Villains. Wednesday: Chapter 5 of my on-line serial Shades of Errol Flynn. Now that the edits are done on the really good book I have no more excuses not to sail full steam ahead on the edits for An Elemental Wind. It’s not as heinous as I thought it would be, just a little time consuming because I’m working from a hard copy. This actually works out well though because I’m puppy-sitting four out of five days this week so I can take it with me. The writing was going well enough last week that I managed to get a few chapters ahead in Shades of Errol Flynn. This week I’d like to get ahead in Fire as well. Sometimes the journal entry can take as long to write as the rest of the instalment which means I’m up pretty late writing it. So, the first goal is to get ahead in the journal entries again, and then try and get ahead in the chapters. There’s still lots of transcription to do on the Living History project, plus sound editing to do on the computer. It’s not hard work to do, just tedious. I keep forgetting about the new pictures taken for my website last week, so that’s on this week’s list (again) as well. And while I’m at it, maybe I’ll get back to working on my website, I’ve been slacking off where it’s concerned. And that’s pretty much my week. What about you? What will you be up to? Sorry folks, I dropped the ball again. This week's installment of Fire is going to be delayed until this afternoon. Please check back later. Triquint is a verse form invented by Sylvia A. Feeley. It consists of 3 verses, 5 lines each. It has a strict syllable count and rhyme scheme. Lines 3 and 4 of verse 1 repeat in verses 2 and 3 as a refrain. The syllable count for each stanza is 9, 7, 5, 3, 1 and the rhyme scheme is aaAAb (the capital letters refer to the repeated lines). The last word in lines 1,2,3,4 of each verse rhyme and line 5 of each verse rhymes. Emperor Vespasian, founder of the Flavian Dynasty, started construction of the Colosseum in AD 72. It was completed in AD 80 by his son, Titus, and known as the Flavian Amphitheatre. The name "Colosseum" was not used until 7th century, and was derived from the colossal statue of Nero that once stood nearby. This statue was later remodeled by Nero's successors into the likeness of Helios, or Apollo, the sun god, by adding the appropriate solar crown. The statue remained standing well into the medieval era and was credited with magical powers. It came to be seen as an iconic symbol of the permanence of Rome. The statue did eventually fall, possibly being pulled down to reuse its bronze. By the year 1000 the name "Colosseum" had been coined to refer to the amphitheatre. The statue itself was largely forgotten and only its base survives, situated between the Colosseum and the nearby Temple of Venus and Roma. The exterior of the Colosseum is made entirely of travertine, a form of limestone, stretching 527 metres around and four stories high. The arches of the second and third stories were originally filled with statues. There were 80 entrances, with the two principal ones reserved for the emperor and his entourage. The Colosseum was covered with an enormous awning known as the velarium to protect the spectators from the sun. It was attached to large poles on top of the Colosseum and anchored to the ground by large ropes. A team of some 1,000 men was used to install the awning. The interior was made of brick, tufa (another form of limestone) and marble. The central area, the arena, was covered with a great wooden floor and canvas to make it waterproof. Over this was a layer of sand to absorb blood. The word "arena" derives from the Latin word for sand. The floor is now exposed down to its underground passages, where beasts and gladiators awaited their fate, and crossed by a modern walkway. Above the ground are four storeys, the upper storey contained seating for lower classes and women. The lowest storey was preserved for prominent citizens and surrounded by a 5 metre-high wall to protect them from attacks by wild beasts. Below the ground were rooms with mechanical devices and cages containing wild animals. The cages could be hoisted, enabling the animals to appear in the middle of the arena. In total the Colosseum could hold up to 55,000 spectators. The amphitheatre was used for gladiatorial combats, mock sea battles, animal hunts, executions, re-enactments of famous battles, and dramas based on Classical mythology. The inaugural festival of the Flavian Amphitheatre, which was the largest amphitheatre in the world, lasted 100 days, during which over 5,000 wild beasts were killed in the arena. The Colosseum was damaged by fire and earthquake several times but was continually restored until the end of the 5th century. Gladiatorial combats were outlawed by the Christian emperor Honorius in 407 and fights with wild beasts were banned in 523. After this, the arena went out of use. It fell into disrepair shortly after its closure in 523. In 526, the barbarian Totila and his forces destroyed parts of it in order to take the valuable bronze clamps that held the stones together. After that, Romans freely helped themselves to the great arena's stones in order to build their houses. In this period the Colosseum was also used as a Christian burial ground. Early Christian tombs have been found in three areas around the amphitheatre: in the foundations on the north and east sides and on the exterior ground near the present entrance. In the Middle Ages, the Colosseum was situated on the most important pilgrim route in Rome, which led from St. Peter's to the Lateran, and a small suburb grew up around it. In this period the great arena was thought to be a Roman temple to the Sun because of the Colossus statue of Nero-turned-Helios that stood next to it. In the 13th century, the Colosseum was fortified and occupied by the Frangipani family and the suburb around it became a prosperous area of Rome. However, the area later fell prey to malaria and was abandoned. 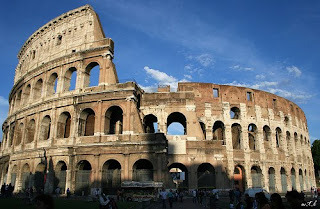 Looting of the stone continued on-and-off until the 18th century, when Pope Benedict XIV (1740-58) declared the Colosseum sanctified by the blood of early Christian martyrs and added Stations of the Cross to the arena. After this it was restored and excavated, a work that continues to the present day. I had a great time with my grand-puppy-son and I posted the pictures on my Facebook page. He is the cutest thing ever, but I may just be a little prejudiced . Towards the end of the week I got slammed by an idea I’ve had off and on over the last few years, but this time it was fully developed, including having a title. Normally this wouldn’t be a bad thing, but I’ve got too many other projects on the go, I don’t have time to work on something new. So, I wrote out a synopsis, including the title and the names of the two characters. Now my subconscious is leaving me alone, secure in the knowledge its idea won’t be forgotten. Edits are going well, both for my book and the really good book. Read a few more books last week, both print and on George, and remembered to update my Goodreads list. Tuesday: Part II of the Seven Wonders of the Medieval World is the Colosseum of Rome. Thursday: This week will feature the invented form of the Triquint. Today: I want to know what’s up with China. I suppose I’ll be continuing with the edits on An Elemental Wind as well, but it’s just not as much fun working on my own stuff. It seems too much like . . . well, work. There’s lots of transcription to do on the Living History project, so when all else fails I’ll be working on that. I’ve also got a bit of sound editing to do on the computer – some of those interviewers were very soft-spoken and the volume needs to be pumped up in places. It’s not hard to do, just tedious. Hyangga was the first uniquely Korean form of poetry. The word hyangga means "native songs," from Korea as opposed to Chinese songs. Hyangga poetry was written in Korean using a system called idu, literally "clerk's writings. Idu was a system whereby Koreans would use Chinese characters to express Korean. The key to the system was to use some Chinese characters for their intended purpose, their meaning, and others for their pronunciation, ignoring their pictographic meaning. On the surface, it appears to be a complicated, even incomprehensible system, but after using the system one become comfortable with certain characters consistently standing for Korean words, and others representing Chinese. Fourteen poems in the Hyangga style from the Shilla period have been preserved in the Samguk yusa (Memorabilia of the Three Kingdoms). This poetic form was passed down to the Koryo Dynasty, and 11 poems from that period are preserved in the Kyunyojon (Tales of Kyunyo). Many of the poems are elegies to monks, to warriors, and to family members. The Silla period, especially before unification (668) was a time of warfare and the hyangga capture the sorrow of mourning for the dead while Buddhism provided answers about where the dead go and the afterlife. Hyangga can be seen as 4-line, 8-line, and 10-line poems. It is thought that the 4-line poems with their ballad-like attributes may indicate that the poets came from a broad range of backgrounds. The 10-line poems, with the most developed poetic structure, are divided into three sections of 4-4-2. Most of the 10-line poems were written by priests or by the Hwarang ("flower warriors"). These warriors were the backbone of the Shilla aristocracy. The 10-line poems reflect the emotions of the aristocrats and their religious consciousness. The hyangga can consist of 4, 8, or 10 lines. When using 10 lines, it is divided into three verses – 2 verses of 4 lines and a couplet. Seodong-yo" (The Ballad of Seodong), which is the oldest known hyangga, is a simple, four-line song whose lyrics tell the love scandal of Princess Seonhwa of the Silla Kingdom (57 B.C.-A.D. 935). The song was composed by Seodong, a witty, sweet potato-seller in the marketplace in order to trick the king into disowning the princess. The princess later married Seodong, who later became King Mu of the Baekje Kingdom (18 B.C.-A.D. 660). The song was enjoyed for the next 370 years. casting a light on the window. is to become Seodong's bride. Oh grant me eternal life! By the first winds of autumn. Until I meet you in the Pure Land. Written by Master Wôlmyông (c. 742-765), translated by Peter H. Lee. Reflecting his face in the Iro. Written by Master Ch'undam (c. 742-765), translated by Peter H. Lee.